Conventional wisdom often dictates that in order to boost the performance capabilities of a road car, an inevitable trade-off must be made in terms of comfort, drivability, amenities, and so on. After our seat time in the all-new GTI last year, we left San Francisco thoroughly convinced that VW had reclaimed the title as the manufacturer with the hot hatch to beat. Because of that great mixture of fun, usability and pragmatism, we approached our stint with the new Golf R with some slight trepidation, wondering if the car’s bolstered enthusiast credentials would upset the balance of such a well-sorted vehicle. Fortunately, our concerns were unfounded – the Golf R retains all of the GTI’s best attributes and cranks up the sporting prowess considerably with virtually no drawbacks – provided you don’t spend too much time looking at your bank statement after you leave the dealership. 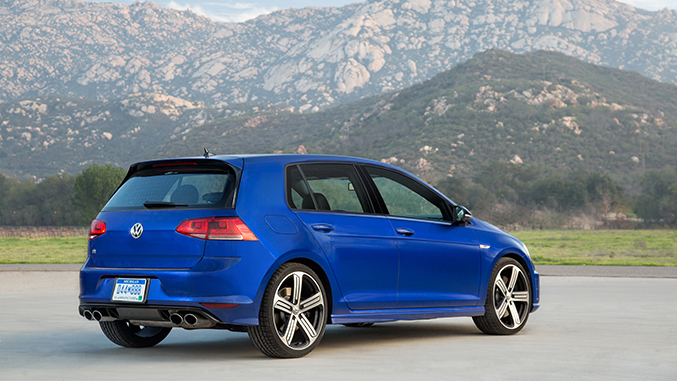 What is the idea behind the 2015 Volkswagen Golf R? 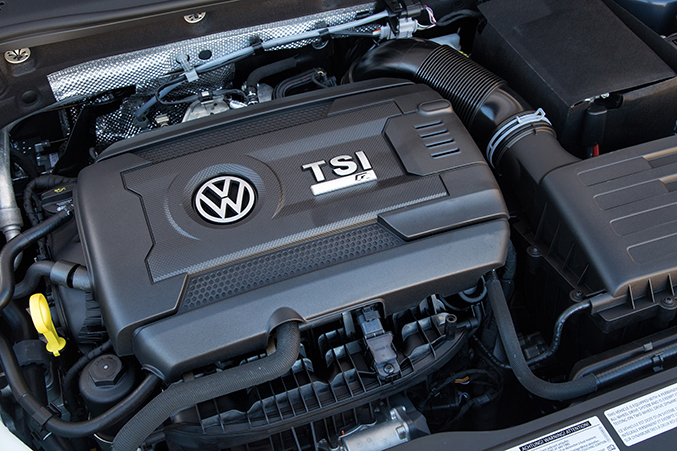 While the motors of the GTI and the Golf R might share identical displacement specifications, the Golf R’s 2.0-liter turbocharged and direct-injected four cylinder mill makes 290 horsepower and 280 pound-feet of torque, 70 hp and 22 lb-ft more than the GTI. The Golf R also sends that power to all four wheels via the 4Motion all-wheel drive system with a fifth-generation Haldex coupling system that incorporates the use of an XDS+ electronic differential that’s designed to mitigate understeer through the bends. Along with stiffer suspension tuning, uprated brakes and gripper rubber, the Golf R also gets a host of subtle styling tweaks to go with its fairly expansive roster of standard amenities. Its performance envelope and feature set put the Golf R up against cars like the BMW M235i and Subaru WRX STI, though the VW applies its own take to the segment, one which gives the Golf R a unique personality among that competitive set. Like many proponents of hot hatches, we prefer ours with three pedals. While the 2015 Golf R can be specified with either a six-speed manual gearbox or the six-speed DSG automatic with paddling shifting, the former won’t be available until this summer. Accordingly, our test car is equipped with the latter, but quite frankly, we couldn’t find fault with it. Paired with the new EA888 engine that’s shared with the Audi S3, the DSG-equipped Golf R is capable of dispatching sixty mile per hour sprints from rest in under five seconds. Shifts are nearly seamless at wide open throttle, giving the automatic equipped cars nearly a half-second lead from 0-60. We’d suspect a lot of that advantage comes from the car’s launch control system though – burying the throttle from a standstill without it does yield some off-the-line lethargy while the whole operation gets spooled up, even in the Golf R’s raciest of driving modes. At full chat the motor gives off a subtle, yet pleasingly spirited growl, and pulls with enough linear urgency to make the Golf R feel significantly lighter than its near 3300-pound curb weight. And despite the added grunt of the Golf R’s motor in a vehicle that has its origins in a front wheel drive platform, torque steer is nonexistent thanks to the well-executed application of the 4motion all-wheel drive system, which can direct power between the front and rear wheels intelligently based on whether you’re plodding along in traffic or tearing along your favorite back road. How does the Golf R handle? Although VW’s DCC adaptive damping system is available on the Golf R, our tester came with the standard suspension, albeit with the requisite Golf R sport tuning. Truth be told, after spending a substantial amount of time in both urban traffic and mountain switchbacks, we’d be fine sticking with this non-adaptive setup, which offers taut manners and flat cornering while dispatching rough patches of tarmac with little drama. That suspension is a well-suited companion to the new variable-ratio electric power steering system, a unit that’s appropriately weighted and provides enough communication to instill some trust when pushed, which is especially nice when you consider the fact that the car’s stability control systems are now fully defeatable for the first time ever. The Golf R's brakes are shared with the Performance Package-equipped GTI, with 13.4" rotors up front and 12.2" units in the rear, though the calipers get R badging here for some added flair. We noted that the stoppers remained sharp and predictable during extended jaunts up and down Angeles Crest Highway, and the pedal had a nice, progressive feel to it that never seemed overly grabby at the top and but also never made us second-guess how much pressure to apply to get things settled down in a hurry. All told, the Golf R proved itself to be one of the most rewarding cars to tackle a canyon road with that we’ve tested in recent memory – high praise when considering some of the high-buck company that places it with. In German tradition, the Golf R is not a car that shouts its intentions to heavens, instead relying on subtle touches to show its hand instead. Truthfully, the GTI in many ways has a more daring aesthetic than this sportier iteration, with its rakish large front intakes and angular alloys, but that isn’t to say that the Golf R isn’t a handsome vehicle in its own right. Perhaps a nod to the expected “maturity” of potential Golf R buyers, refinement gets a bigger emphasis here than shiny doodads and loud reminders of its performance credibility. Following that theme, the Golf R’s sport seats, while reasonably bolstered, lean more toward the comfort side of the equation that the sport – with the tenacious grip this car is capable of, we found ourselves wishing for some buckets that were more tailored to the task of corner carving. That said, when navigating city streets and trudging through traffic, these fit the bill nicely. Mechanical upgrades aside, the Golf R is not a dramatic departure from the GTI, which is fine considering that we found the latter to be a great place to spend some time. The tweaks that are there do not distract or feel gimmicky, resulting in a car that just feels on-point without having to constantly remind you that it is. We can understand if some buyers would find it hard to shell out more than $37,000 for a Golf, especially considering the bounty of other options available around that price point. Still, with the utility of its five-door hatch configuration, the refinement of its interior and overall presentation, paired with this car’s ability to simply astound us when driven hard, we’d implore potential cross shoppers to get some seat time in this car before making any decisions. 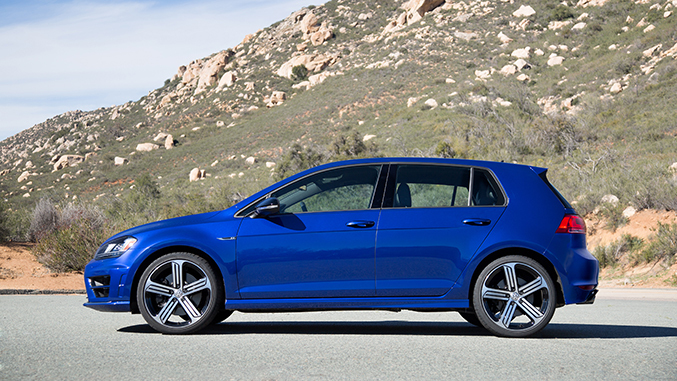 We had high expectations going into our test of the Golf R, and it exceeded them in almost every way. Yes, it is that good.